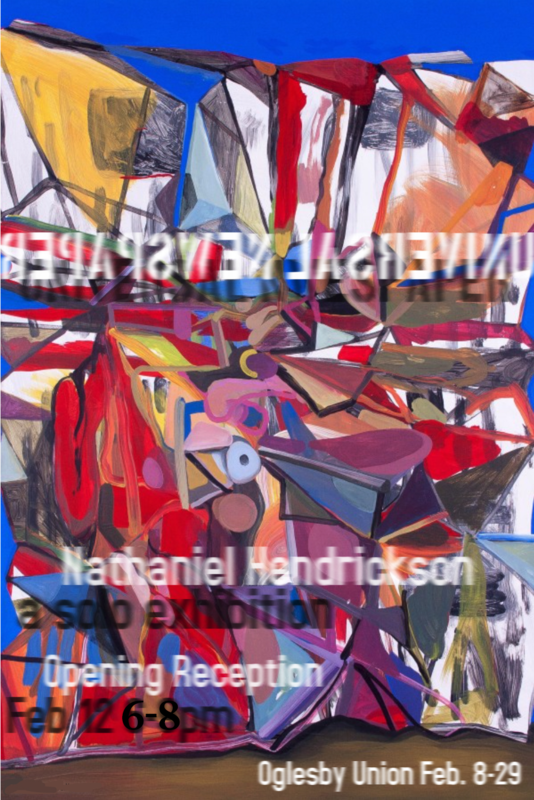 Oglesby Union Gallery is hosting a solo exhibition entitled Universal Newspaper, new paintings and drawings by first year MFA candidate Nathaniel Hendrickson. This exhibit marks the second major display of his work in Tallahassee. The show will run from February 12-29 with an opening reception this Friday, February 12th from 6-8pm. In addition to FREE refreshments and gifts being served at the opening, the artist will be performing as himself in dialogue with the public. Oglesby Gallery is open Monday-Friday 8-10pm, Saturday and Sunday 12-10pm. The Oglesby Gallery was created to provide an exhibition space for artists that are part of the Florida State University community to explore contemporary, alternative and traditional formats and philosophies. This exhibition will attempt to synthesize those formats and philosophies on the opening night.